So STW has recently published a snapshot of data from the insurer ProtectYourBubble, as some of the statistics present an entirely different picture to what official statistics actually say I thought it would be interesting to look at how insurance figures can actually differ from the “real” picture and update our statistics page whilst I’m at it. I don’t think these statistics are particularly interesting as they don’t account for a brands relative popularity (i.e there are more Specialized bikes out there, so of course more get stolen) but none the less I ran the Metropolitan Police figures against Protect Your Bubble’s and found that indeed Specialized is the number 1 brand in the UK (for both buying a bike and stealing one). What is interesting though is that a whopping 27% of people couldn’t identify the brand of their stolen bike to the police (or it wasn’t recorded). 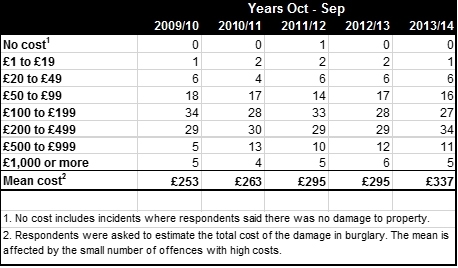 Protect Your Bubble say that “The average cost of a stolen bike was £974.80“, whilst the Home Office reduces that figure down to £337. I’d put the difference down to people being more likely to insurer their £1,000 bike. Protect Your Bubble say “Of those who claimed for a stolen bicycle, 72% had it stolen from a location other than their home, while 23% had their bicycle stolen from their home.” (not sure what happened to the other 5%). The Home Office statistics are almost reversed with 68% of bikes being stolen from an owners home, 5% being stolen from a work place, and 27% being stolen from other locations (this adds up to 100%). A rather pointless list as it will largely just highlight areas with high bike use but it’s interesting that the insurers data points to London as dominating the top 5, whilst Oxford and Cambridge are clearly a favourite for thieves on the official data. Perhaps this could be put down to the type of person who is likely to buy bicycle insurance. Whilst we don’t have a direct comparison for this I do have the data for each police force, which provides a rough guide to how this data changes, again I suspect differences will largely be based on the type of person who insurers their bike. Good point raised here, one also has to think about the bikes which have been stolen, but not reported, or completely stripped and abandoned. Many thanks for the comment Sav. The crime in England and Wales survey does this to a degree, what happens is they take a random selection of the population and ask them a series of questions about crime. The sample size for bike theft is a little small but it’s how we know only 1 in 4 bike thefts get reported.